Masahiro and Mao Harada of Mount Fuji Architects Studio wanted to break with the traditional definition of a house when they designed this small Tokyo home. They achieved their goal by using the same material for the ceiling, the walls, and the floor, creating a space that flows beautifully. 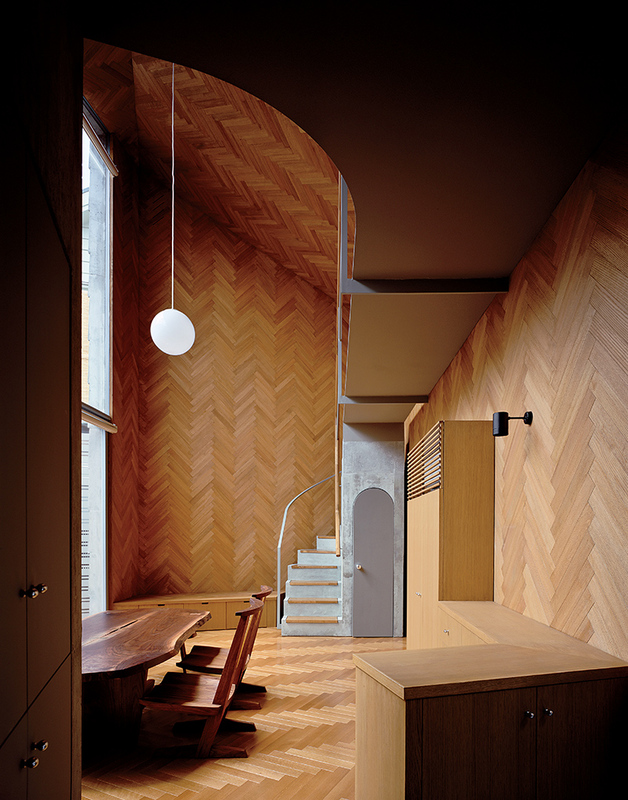 When Masahiro and Mao Harada of Mount Fuji Architects Studio designed this tiny Tokyo home, they decided to cover the interior surfaces with oak boards hammered one-by-one into a honey-colored herringbone pattern. “Using a different material for the wall versus the ceiling versus the floor has become a symbol that signifies a typical ‘house,’” says Masahiro. “I wanted to get away from that and create something more like a cave. I thought that would free up the residents’ approach to how they proactively use the space.” The resulting effect is elegant and warm—and a perfect foil to the home’s steely gray staircase.